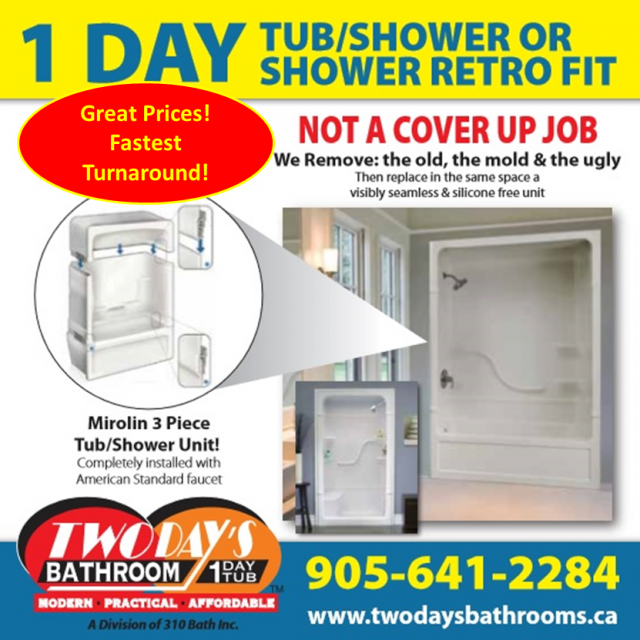 If you want a stunning new bathtub or shower renovation in one day or a tub to shower conversion, our tub/shower package features minimal demolition, done efficiently, economically and expertly by the team at Twoday’s Bathrooms™ serving St. Catharines, Niagara Falls, Welland, Pelham, Niagara-on-the-Lake, Port Colborne, Thorold, Fort Erie, Crystal Beach, Grimsby, Lincoln, Wainfleet, West Lincoln as well as the Hamilton area. With our FAST FIT SYSTEM we remove all of the old, professionally prep the area including any required repair work and replace it in the same space with a new 3-piece Freestanding Tub/Shower unit or perform a Tub to Shower Conversion. OR complete the contact form at the bottom of this page. A modern, easy clean finish in this tub shower features large shelving, a built in towel bar and comfortable lumbar support. We have developed and perfected our proven Fast Fit System, and will take care of everything for you, from conception to completion. We also GUARANTEE a timely renovation and workmanship. We remove all of the old, the mold and the ugly and replace it in the same space. 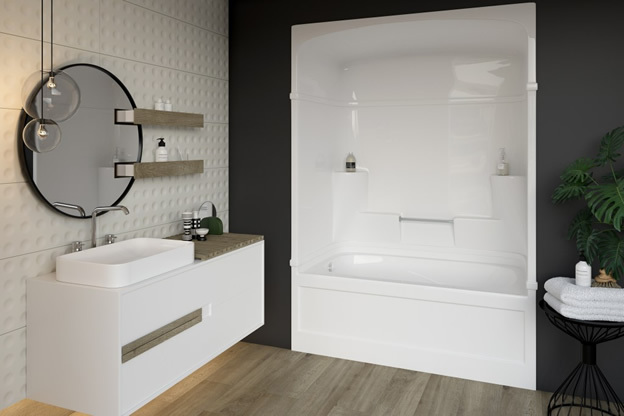 We professionally prep the area including any required repair work and install your new 3-piece Freestanding Tub/Shower unit or perform a Tub to Shower Conversion. Units are reinforced with plywood and fibreglass then anchored to the existing alcove. They are also trimmed in with casing, tying it to the surrounding décor. Twoday's Kitchen and Bath is located in the Niagara Region and a division of 310 Bath Inc which has been providing quality on budget renovation solutions for over 25 years. © 2019 Two Day's Bathrooms.